We’d love your help. 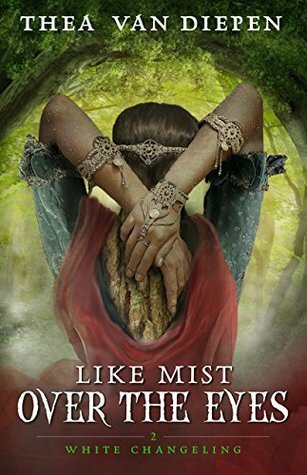 Let us know what’s wrong with this preview of Like Mist Over the Eyes by Thea van Diepen. Sometimes there was a man weeping. Sometimes there was a fire. But always there was the sword. Adren escaped with her life back in Watorej, but her tussle with the potion-maker has knocked something loose in her mind. Really loose. The dreams—if they even are dreams—are frequent and disturbing, and Adren finds it increasingly difficult to keep a grip on her own mind. Sometimes there was a man weeping. Adren escaped with her life back in Watorej, but her tussle with the potion-maker has knocked something loose in her mind. Really loose. The dreams—if they even are dreams—are frequent and disturbing, and Adren finds it increasingly difficult to keep a grip on her own mind. Luckily Nadin is around to help out, but for how long? His human side, however slight it may be, ensures that he’ll eventually turn on her… doesn’t it? For now, Adren and Nadin still search for the cure to the unicorn’s madness, and soon they stumble into an age-old feud between a fairy mound and the nearby human town. With one side seeing her as a plaything and the other as a threat to be stamped out, it’s up to Adren to find the middle ground—but doing so comes uncomfortably close to challenging her most coveted prejudices. The long-sought cure might be merely one good bargain away, but as the game turns ever more deadly amid shifting allegiances and ancient legends turn out to be all too real, Adren must hold it all together before a full-blown war breaks loose. She has to conquer her demons or else everyone will face the consequences. To ask other readers questions about Like Mist Over the Eyes, please sign up. Thea van Diepen spent the first ten years of her life on a tree-wrapped acreage where an inquisitive child might believe in magic. Nowadays, she lives in Edmonton, breathing life into stories in the form of books such as White Changeling series, a webcomic, and a video game.